RALEIGH (WTVD) -- Rides, food, and games are often big attractions at the NC State Fair, but taking a trip to the fairgrounds could also put some money back in your pocket. 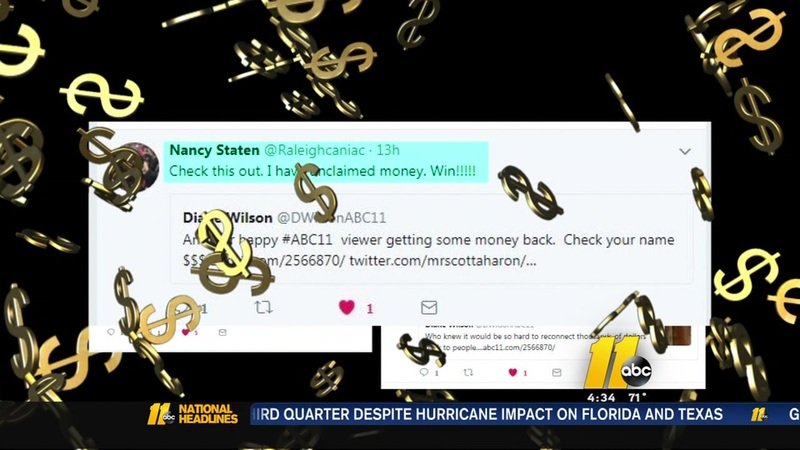 The North Carolina State Treasurer's Office said it's holding on to millions of dollars in unclaimed cash and some of it could be yours. State Treasurer Dale Folwell said he hopes all fairgoers will stop by the department's booth to check the NC Cash database for their name or the names of family members. "Every year we find hundreds of thousands of dollars that belongs to fairgoers," Folwell said. "We actually have more records of money and things than we have citizens of North Carolina." Money, money, money! Thanks to our story on the millions of dollars in the unclaimed funds, we reunited people with hundreds of thousands of dollars. Right now, there is a total of $711 million owed to North Carolinians. The unclaimed property includes bank accounts, wages, utility deposits, insurance policy proceeds, stocks, bonds, and contents from abandoned safe deposit boxes. In addition to individuals, many businesses across the state are owed. This year, the treasury department returned $16,000 to the Pamlico County Habitat for Humanity and there a total of 24 Habitat for Humanity locations on the state's list. If you want to visit the state treasurer's booth you can find it inside the Kerr Scott Building at the state fairgrounds. If you are owed money, claims are usually processed within 90 days and there are no fees involved.